Foreword. List of Authors. Nonstoichiometry and related properties of ceramic interfaces (J. Nowotny). Studies of interfacial behavior in ceramics via microdesigned interfaces (A. Glaeser). Interfaces in zirconia based electrochemical systems and their influence on electrical properties (S.P.S. Badwal, J. Drennan). Application of low energy ion scattering to oxidic surfaces (H.H. Brongersma et al.). Interfacial phenomena in Y2O3-ZrO2-based ceramics: a surface science perspective (A.E. Hughes). Important role of the interfaces in the high temperature superconductors (S.X. Dou, H.K. Liu). The role of interfaces in nuclear technology (M. Yamawaki). Some aspects of grain boundary diffusion in oxides (E.G. Moya). Chemical and structural alteration in the surface layers of oxides and sulphides (R.St.C. Smart et al.). Interfaces in ceramic substrates (K. Niwa). Diffusion-induced grain boundary phenomena in metals and oxide ceramics (E.I. Rabkin et al.). Thin films on grain boundaries in metals and ceramics and their importance for the properties of the materials (E.I. Rabkin). Systematic understanding of ceramic processing and related interfacial phenomena (K. Uematsu, Y. Zhang). Interface phenomena in synroc, a titanate-based nuclear waste ceramic (E.R. Vance et al.). Chemical and polar nanodomain fluctuations in relaxor-type lead scandium tantalate (L.A. Bursill et al.). Copper and nickel ultrathin films on metal-oxide crystal surfaces (P.J. Moller). The surface chemistry of tin (IV) oxide: defects, doping and conductivity (R.G. Egdell). Impact of grain boundaries on properties of mullite as a solid electrolyte (K. Yamana et al.). High temperature embrittlement of ceramic matrix composites - interface effects (J.L. Cocking). Multilayer ceramic capacitors with nickel electrodes (H. Kishi, N. Yamaoka). Corrosion properties of ion plated TiN and CrN coatings (H. Ichimura, A. Kawana). Direct energy conversion in single gas mixture by an oxide solid electrolyte electrochemical cell and its applications in multi-gas sensing (D.Y. Wang). 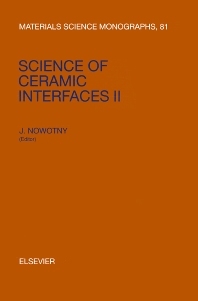 Trends of research on ceramic interfaces (J. Nowotny). Subject Index. This collection of papers arose from the Proceedings of the International Workshop on Interfaces of Ceramic Materials held in Australia, 1993 and is a continuation of the previous book published under the same title. The objective of the Workshop was to discuss research progress on the chemistry of ceramic interfaces and related industrial aspects. Due to the multidisciplinary character of ceramic interfaces the book contains articles covering several areas of expertise, including ceramics, surface science, solid state electrochemistry, metallurgy and high temperature chemistry. Some technical papers are also included in this volume. Scientists and engineers working in these areas, as well as students in materials science and engineering, will find this book of particular significance.